We love technology and how it can improve our lives. We want to protect those that want to use technology to steal and profit of hard working people. Contactless payment cards speed up small payments you make in store. The card always has your data ready to send out. Scammers can skim your data without you knowing. The Myne Card blocks scammers from taking your data. The contactless blocker lives in your wallet or purse. Often designs are forced upon people, whether it’s your bank or loyalty card. We wanted to combine technology with the most beautiful and recognisable art in history. 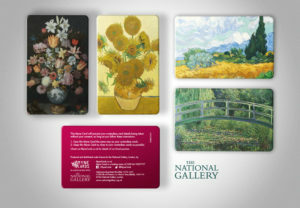 Myne Cards have partnered with The National Gallery, London, to reproduce the works of Van Gogh, Basschaert the elder and Monet ready for your wallet or purse. We would like a review the National Gallery Myne Card. First impressions of the art and design. How it fits in the bloggers wallet/purse. We would like you to check that the card blocks their contactless bank card. Either using a smartphone with NFC or going to the shops and having the Myne Card in front of their bank card when attempting to pay. We can give you further details if you require. We want bloggers who have a following on Facebook and/or Twitter of 500+ people. We also believe the Myne Card will look great on Instagram and Pinterest, so get in contact if you think it will be a good fit with your followers on those platforms. Affiliate payment. Percentage increase with higher volume of buyers.